Acetylsalicylic (pronounced uh-SEE-tuhl-sa-luh-si-lik) acid, commonly known as aspirin, is the most popular therapeutic drug in the world. Sold without a prescription as tablets, capsules, powders, or suppositories (a meltable form for insertion into a body cavity), it reduces pain, fever, and swelling, is believed to decrease the risk of heart attacks and strokes, and may protect against colon cancer and help prevent premature birth. Aspirin is often called the wonder drug, but it can have some serious side effects: its use results in more accidental poisoning deaths in children under five years of age than any other drug. In the mid- to late 1700s, English clergyman Edward Stone chewed on a piece of willow bark and discovered its analgesic (pain-killing) property after hearing an "old wives' tale" that declared a brew from the bark was "good for pain and whatever else ails you." The bark's active ingredient was isolated in 1827 and named salicin from the Greek word salix, meaning "willow." Salicylic acid was first produced from salicin in 1838. It was first produced synthetically (meaning produced in a lab from chemicals) from phenol (an acidic compound) in 1860. This synthetic product was effective in treating rheumatic fever and gout but caused burning of the throat and stomach upset. In 1897, a chemist named Felix Hoffmann, working at Bayer Laboratories in Germany, synthesized acetylsalicylic acid in a successful attempt to eliminate the side effects of salicylic acid. Soon the process for making large quantities of acetylsalicylic acid was patented (allowing only the person or company who developed the product to manufacture or sell the product for a set number of years). Aspirin—named for its ingredients, acetyl and spiralic (salicylic) acid—became available by prescription. Its popularity was immediate and worldwide. Huge demand in the United States brought manufacture of aspirin to that country in 1915, when it also became available without a prescription. Analgesic/anti-inflammatory action. Aspirin is commonly used to relieve pain and reduce inflammation, the body's local response to any event causing tissue damage, which includes pain, redness, swelling, and hotness of the affected area. It works best against pain that is bearable; extreme pain is almost entirely unaffected, as is pain in internal organs. Aspirin blocks the production of hormones (chemical messengers formed by the body) called prostaglandins, which are often released by an injured cell. Prostaglandins in turn trigger the release of two other hormones that make nerves sensitive to pain. Aspirin's blocking action prevents this response and therefore is believed to prevent tissue inflammation. Remarkably, aspirin only acts on cells producing prostaglandins (for instance, injured cells). The effect of each dose lasts approximately four hours. Analgesic: Compound that relieves pain without inducing loss of consciousness. Antipyretic: Anything that reduces fever. Hypothalamus: A small area near the base of the brain where release of hormones influence such involuntary bodily functions as temperature, sexual behavior, sweating, heart rate, and moods. Platelets: Irregularly shaped disks found in the blood of mammals that aid in clotting the blood. Inflammation: The body's response to tissue damage, which includes pain, redness, swelling, and hotness of the affected area. Prostaglandins: Groups of hormones and active substances produced by body tissue that regulate important bodily functions, such as blood pressure. Antipyretic action. Aspirin's antipyretic (fever-reducing) action is believed to occur at the anterior (frontal) hypothalamus, a portion of the brain that regulates such functions as heart rate and body temperature. The body naturally reduces its heat through perspiration and the dilation (expansion) of blood vessels. Prostaglandins released in the hypothalamus inhibit the body's natural heat-reducing mechanism. As aspirin blocks these prostaglandins, the hypothalamus is freed up to regulate body temperature. Blood-thinning action. One prostaglandin, thromboxane A 2 , aids platelet accumulation. (Platelets are cells involved in the clotting of blood.) Aspirin inhibits thromboxane production, thus "thinning" the blood. It is frequently prescribed in low doses over long periods for at-risk patients to help prevent blood clots that can result in heart attacks and strokes. Poisoning. Because aspirin is easily available and is present in many prescription and nonprescription medications, the risk of accidental overdose is relatively high. Children and the elderly are particularly susceptible, as their toxicity thresholds (the point at which the body reacts to a drug dosage as poison) are much lower than average adults. 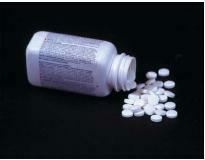 About 10 percent of all accidental or suicidal poisoning episodes reported by hospitals are related to aspirin. Bleeding. As aspirin slows down platelet accumulation, its use increases risk of bleeding, a particular concern during surgery and childbirth. Aspirin's irritant effect on the stomach lining may cause internal bleeding, sometimes resulting in anemia (a condition in which blood does not have enough red blood cells or hemoglobin to carry a normal amount of oxygen). Reye's syndrome. Reye's syndrome is an extremely rare disease, usually striking children and teenagers between the ages of three and fifteen who are recovering from a viral infection, such as influenza or chicken pox. Reye's syndrome is characterized by severe vomiting, seizures, and confusion as well as swelling of the brain and the collection of fatty deposits in the liver. If left untreated, the disease can result in coma, permanent brain damage, or death. The cause of Reye's is unknown, but the onset is strongly associated with the treatment of viral infections with aspirin. Incidents of Reye's in children on aspirin therapy for chronic arthritis is significant. In 1985, these observations were widely publicized, and warning labels were placed on all aspirin medications. This resulted in a decline in the number of children with viruses being treated with aspirin and a corresponding decline in cases of Reye's. Other adverse effects. Aspirin can adversely affect breathing in people with nasal polyps or asthma, and its long-term use may cause kidney cancer or liver disease. There is some evidence that aspirin can delay the onset of labor in full-term pregnancies and, because it crosses the placenta (the organ that provides nourishment to the fetus), may be harmful to the fetus. i noticed that in the document there is no mention of the chemical reactions that occur in the body as the aspirin dissolves or what actually triggers these reactions as the aspirin and solution in the stomach are both acids. how do know that this is true facts without having to look at different websites to check myself for a project?